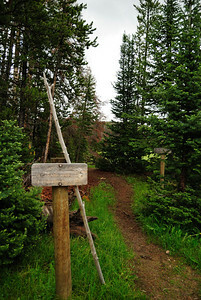 July 3, 2009 saw me dodging rain clouds exploring for new trails in the Zirkels. 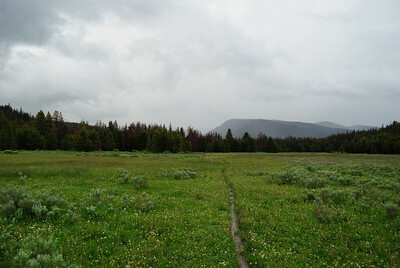 Please go to my trail blogging site (opens a new window) for a full description of the trip. Beginning of the trip. Yes, that's what I was headed towards to go hiking. See the mountains? Yeah, me neither. I had to sit and think about this for a few minutes : ) Sometimes I get up ready to go hiking and I know EXACTLY what direction I'm headed and even what trail I'm going to go hike on. Then, other times, well, let's just say I take each step as it comes. Let's see, uh, step one. Get in car. OK. We are sitting in car. Now, turn the key on. Good. Good. Now get to road and, ooops major decision time. Right or left? Well, this was one of those times. 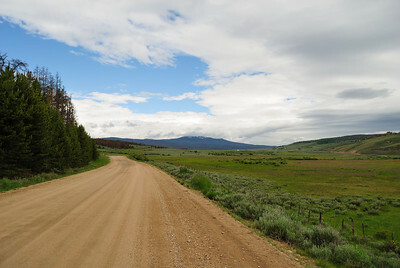 I kept making all the turns that led me to Laramie, then towards Walden, then turn right at Cowdry, then. Oh my. time to stop and look at the, well, no, can't look at the mountains because its RAINING! Mutter a few cuss words and glare for a minute. So, whatever. I drive on. Hey, I feel good just getting out of town and being in the mountains. So, onward I head. To, well, I wasn't really sure, but I was pretty sure it was down this road someplace. Pulled into Pearl,.CO (thriving metropolis I tell you, way too crowded to be enjoyable). Hey, the rain kinda vanished some. Amazing. Yeah, that's snow on the distant mountains. 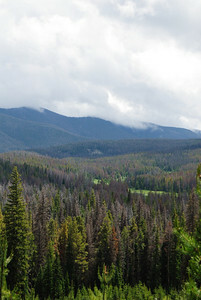 Still a little early in the year for high altitude hiking. Hmmmm. Need to think about some lower trails. 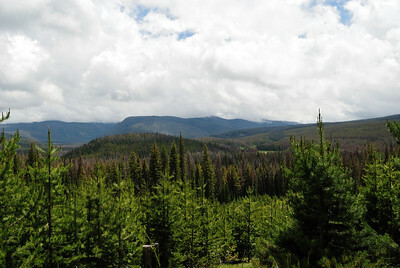 So, the week before I'd been on the Helena Trail out past Big Creek Lakes (just slightly better weather : ). So, decided to just skip going to that area and kept on driving towards another rather choice, no, skip that, uh, rather horrible place I know about. 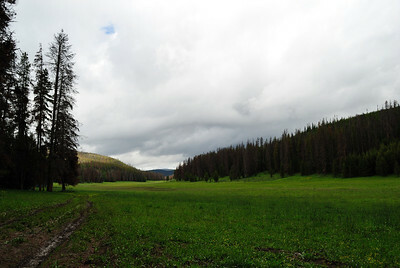 The Encampment River area up above Hog Park Reservoir/Park/Meadows/whatever in Wyoming. Really right on the Wyoming/Colorado border. 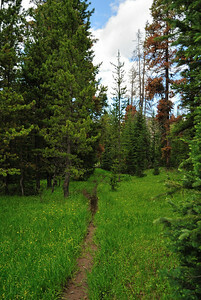 Pretty neat trails in the lower meadows of the various drainages that come down out of the northern part of the Zirkel Wilderness area. Kinda a pretty drive to it from Pearl. 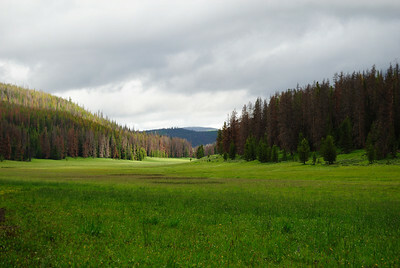 Some pretty big meadows along the way. Think this is a view down Ryan Park. Zoom a little. As I said, nice drive. And, it can be easily done in a 2 wheel drive small vehicle. 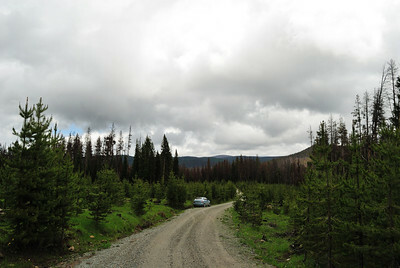 However, it is a forest access road (I think it's just an extension of County Road 6W, but, hard to say). Anyway, you don't see a lot of traffic and it "is" possible to run into snow drifts across the road in June. Or, maybe a tree across the road. 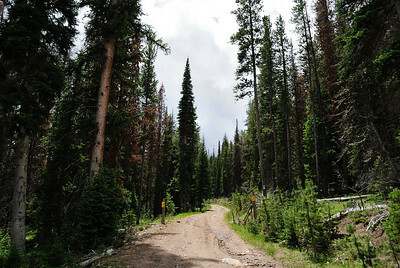 So, unless you carry a saw and ax (as I do), you may not want to try this road any earlier than late June or early July. However, you can always try and just turn around if you need to. Well, the edges of the road can be a little tricky, so don't slide off (no cliffs or anything, but you might end up in a muddy ditch). Otherwise, they keep it in pretty good shape. You can take a different route through Riverside (the way I returned) if you want. Its more heavily traveled (relatively speaking) and should be easier to get through earlier. 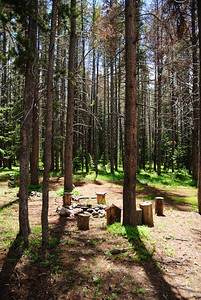 Calling the forest service ahead of time is always a good thing to do if you are planning a trip with a family. Anyway, were was I? Oh yeah. 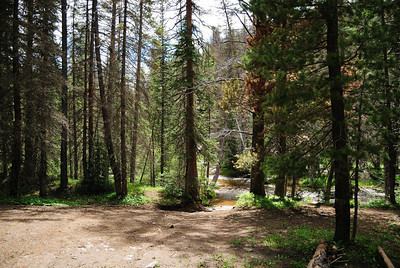 Well, I decided I'd hike up the Encampment River. Looked like a pretty set of meadows and shouldn't be any snow, and I'd never been up it. 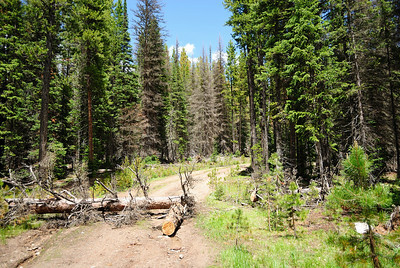 I'd been up the West Fork (they meet right near the trailhead), so thought I'd see what the Encampment trail was like. I got to the trail head and found it blocked. Something about dangerous trees that might attack you. Or something. 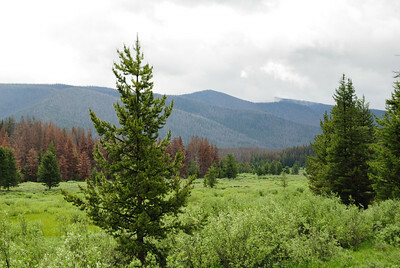 Maybe they thought the area needed to be cleared of dead tree. Anyway, I drove a few hundred yards down the road and pulled off to the side. Good enough. And headed down the trail. Well, up the trail. Hmmm. Looking just a tad dampish. Well, shoot. I was already on the trail. Might as well just keep moving. Unfortunately, it kinda went from little dampish to full wetish. For one thing, the rain came back. Also, the trail turned out to be like wading through a marsh that just happened to have a narrow dirty stream flowing through it. Yeah, say bye to dry feet. And finally, the water was running much higher than I felt like attempting to wade across. 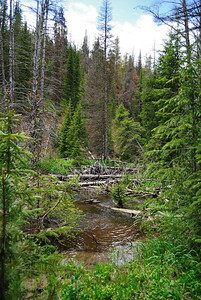 The summer before I'd hiked a mile or so up the river and found some logs to cross over, but I didn't feel like doing that now. 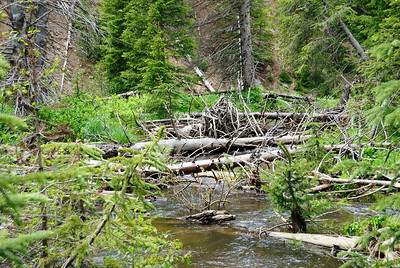 Later this summer, with Will, I located some logs just a short distance up from this spot, but I didn't know about them today (and, they may have been under water at this time anyway). Well, OK. Maybe I should go someplace else. I could take a hint. I took a look at a map I had with me. Hmmm. That road I was parked on looked like it went back a long ways. Hey, look, it goes to where it looks like you could cross into the Zirkel Wilderness. And, then..... Well, there were all sorts of possibilities. So, what the heck. I decided to hike up the road and "investigate" it for a future longer hike. 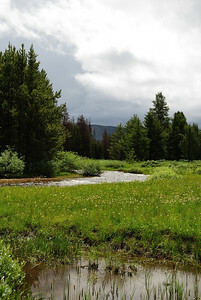 At least it would be drier than tying to hike in the meadows. So, headed back to the car and turned up the road to start to follow it. Whoops. Hold on just a second. What do I see coming up the road (sorry, no photos). Hey, it's someone walking along and leading a llama. Interesting. So, I wait till the man gets up to where I am and we jabber for a few minutes. Turns out he's an artist up doing some painting of the surrounding area. 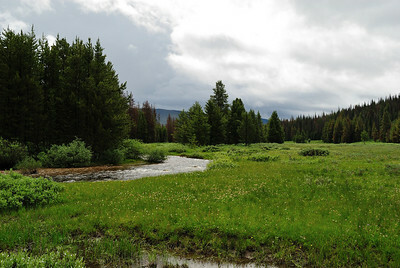 He's got a camp up in the West Fork meadows and is headed there with some more supplies. I ask him what it's like crossing the river (he will have to do that twice on the way to his camp). "Oh, it's a little high. But, I just hang on to the llama and it's pretty much ok." He's a little peeved at the weather as it's been socked in for many days. But, seems as if he's taking it in stride. He's got the trappings and mannerisms of someone that knows their way around the mountains. So, I wish him well and we head our separate ways. I head up the road. It hasn't been traveled on much that I can tell. And, in fact, I end up seeing only 4 people (each on an ATV heading down the road in a group) the entire day on the road. Sure, it's kinda rainy. But, it is the 4th of July weekend. I bet that I would have seen a couple more people if I'd been in Estes Park : ) But, hey, looks nice and the sun is trying to poke it's way through the clouds. After a mile or so, I was able to look down out across the valley where the Encampment and West Fork rivers came together. 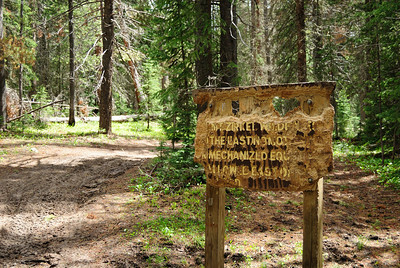 I think the old road I was following is known as the Ellis Trail. The trail/road number is 499 on some maps. It definitely gets some travel, but not a lot. And, most of it is probably in the hunting season. As I said, I saw only one group of 4 people (each on an ATV) the whole day on the road/trail/whatever. And remember, this on the 3rd of July. So, normally considered a pretty busy time up in the mountains. It's quite possible that everyone was just well camouflaged : ) Someone had cut a large enough chunk of the tree so that small ATVs could get through. There may, or may not, be a reason that they left the majority of the road still blocked. Hmmm. I could hear, and occasionally see through the trees, a small stream off to my right. According to my map, it is the South Fork of Hog Park Creek. According to the map, there is a 2-3 mile stretch that falls between where the Ellis Trail crosses it down to where the stream finally runs into the other roads further down in Hog Park. 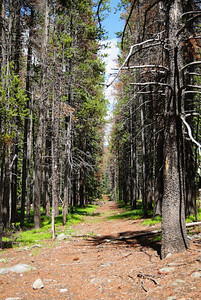 Could be a pretty nice and secluded hike. Not sure what the fishing potential would be. 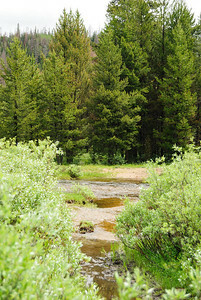 I saw where a trail headed down towards the stream and decided to take a quick look. 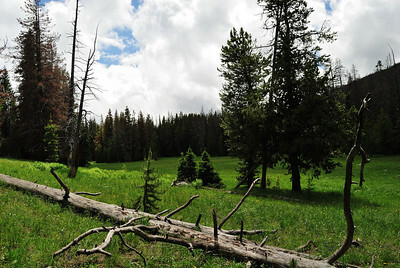 Very pretty set of secluded meadows. 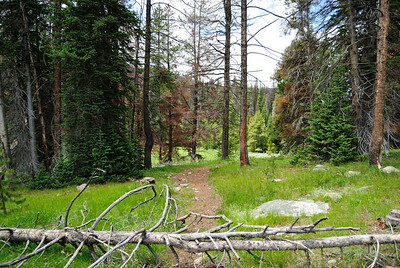 A family could hike in this far (3 miles) and do an overnight camp here. During part of the summer you might want to make sure you had plenty of mosquito repellent. But, there were none around today. Still too early and cool in the season. Here is what the stream looks like. At this time of year, very nice quantity of water. Zoom in a bit. The water level probably goes down a lot as the summer progresses. 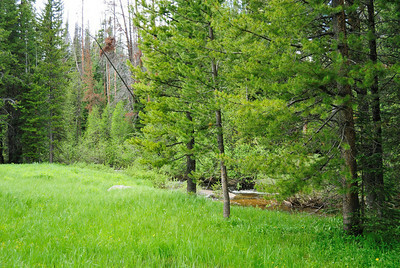 As the road/trail moved away from the stream, I started to see quite a number of campsites. None of which were occupied. Nor looked like they had been occupied since the prior fall hunting season (most likely when this area sees most of its activity). Very clean, flat, and pleasant sites. After two or three miles (closer to three, I think), I came to a crossing. 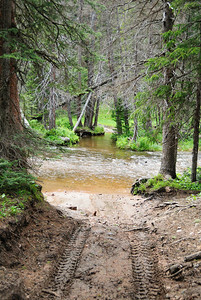 Ellis trail went across the South Fork Hog Park Creek. 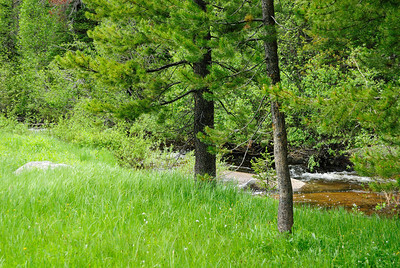 Like the West Fork stream, this one was running pretty high and fast. I think that it would be easy to wade across later in the summer. But hard to wade right now. As can be seen, the ATV went right on across to the other side. I looked around a little for a crossing. And, located a likely spot just downstream. Zoom in a little. Looks very doable. However, it was after 3 pm and I'd been out walking around for some time. 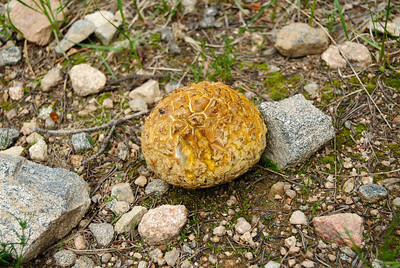 This hike had given me what I was looking for, so I decided to head back to the car. End of the trip on the way back home. Yah, it was worth it. Just for this view. It was way worth it. 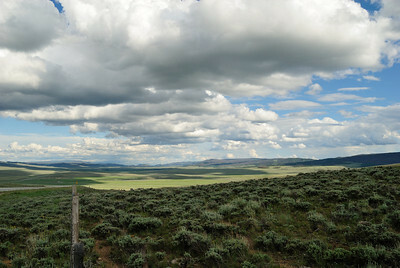 Ten miles north of the Wyoming border, looking south towards North Park (no, you can't see it : ). 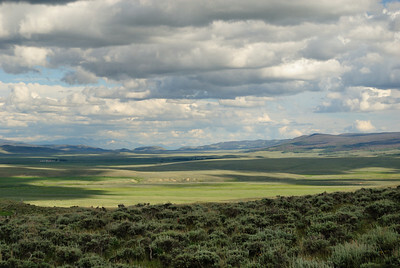 Somewhere south of Riverside, WY. I went back to Fort Collins via a slightly different route. 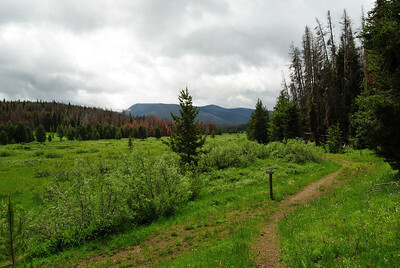 Instead of going back by way of Pearl and Cowdry, I headed north past Hog Park Reservoir to intersect with forest access road 550. 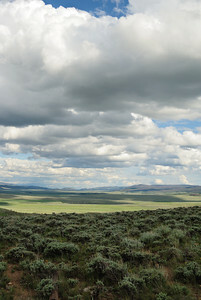 Then headed north to Wyo 70. 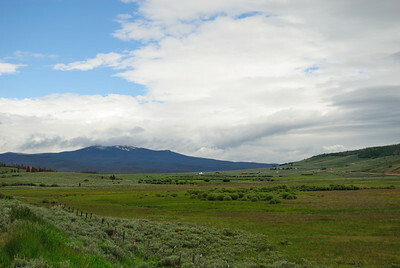 Wyo 70 east to Encampment and Riverside (both in Wyoming). 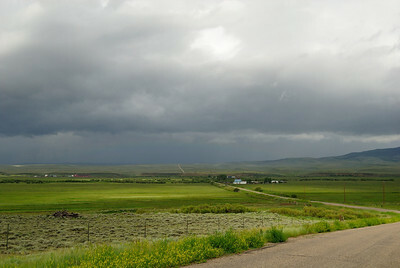 Then Wyo 230 south to where it crosses into Colorado and intersects with Co 127 (and you can head east on back to Laramie). Now, I don't know whether to mention this or not. Oh, ok. Guess I will. But, much like a lot of the places I go, I'll have to tell you that all that traveling takes you through some really nice country. There is a reason for that. If you take a look on the map, the area really isn't on some big route to anywhere. So, it's pretty much just been forgotten. Which is ok with me and, I think, is mostly ok with the people that live there. That said, they are very friendly. At least, the one's I met. 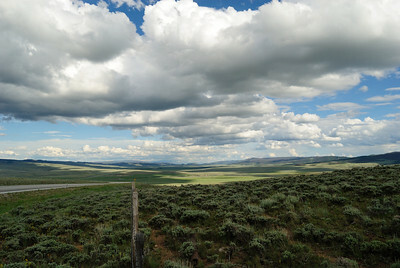 Somewhere between Riverside, Wy and the Colorado border. This area of Wyoming (I need to grab some photos of the towns some time) have a few small towns with big people (if you know what I mean). During the summer time it is a very special place (ummmm, it can be a trifle cold and bleak in the winter : ) You won't have much traffic. No malls. No Walmarts. No crowds.